Tenstep Limited, Contract Electronics Manufacturer based in South Wales made a large investment of almost £250k by upgrading one placement machine on one of their existing SMT Lines as well as buying a new Pick and place machine and printer for a new NPI and prototype line. Tenstep are committed to investing in the latest technology to ensure they can offer the best quality and turnaround to their customers. Part of the investment was to speed up their third line and at the same time increase flexibility and capability. Replacing one 11yr old machine with a ten head HANWHA SM481 gave them around 50% yield straight away. The SM481 is capable of placing 01005 components as standard by flying vision and larger components up to 55mm square and 0.4mm lead pitch but fixed camera. For the NPI/Prototype Line, Tenstep selected the HANWHA SM482L Flexible pick and place machine and ESE US-2000X Fully Automatic Screen Printer, both machines which were featured on Elite 7’s Booth at National Electronics Week Exhibition 2016. The SM482L was carefully selected as the best all round Flexible Pick and Place machine as it not only has a wide component range but also large board handling of up to 1200mm x 510mm, a size Tenstep have never previously been able to offer to their clients. As well as this, the SM482L has some special functions specifically for manufacturing LED Lighting Assemblies. Rank optimisation ensures even spread of LED’s where the LED’s are spread across the PCB so that there are no differences seen in brightness when the LED lights are fitted in factories. The machine also has LED flip check function. 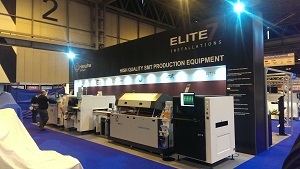 The ESE US-2000X printer is an important part of the NPI line. Accepting both 23” & 29” stencils meant it could be used straight away with their existing stencils. Fitted with 2D inspection where it will inspect the solder paste after printing to ensure the print is right each time, another excellent feature and process to improve Tensteps’ already exemplary quality.